Tires are one of the core components of any vehicle and are manufactured from several types of raw materials along with rubber. The two wheeler tires market caters to specifically three segments such as motorcycles, scooters, and mopeds. The demand for tiress further relies on the sales of two-wheelers. The market is expected to witness intense competition among the current players and also from new players who will try to venture in the market. But being oligopolistic in nature coupled with the presence of leading brands, new players might face challenges while venturing into the market. The aftermarket for two wheeler tires is likely to present players with myriad of opportunities, especially in China, India, and Japan owing to the high fleet size of vehicles. In countries where the fleet size of two wheeler vehicles is high, the replacement rate is also high as because of wearing and tearing. Moreover, as consumers are becoming more concerned about road safety, the demand for two wheeler tiress is also increasing as they have properties such as enhanced grip and anti-skid. The demand for these tiress is relatively high in India as tiress tend to wear out due to improper road infrastructure. The aftermarket in India is also very high as compared to other countries. Transparency Market Research has introduced a new research report on the global two wheeler tires market that covers several important aspects pertaining to the growth trajectory of the global market. Dynamics such as drivers, restraints, important trends, information about market players, product portfolio, strategies, and policies have been highlighted in the report. The report also presents the reader with historical data along with the present and future data. Data pertaining to several segments and regions have also been provided in the market research report. 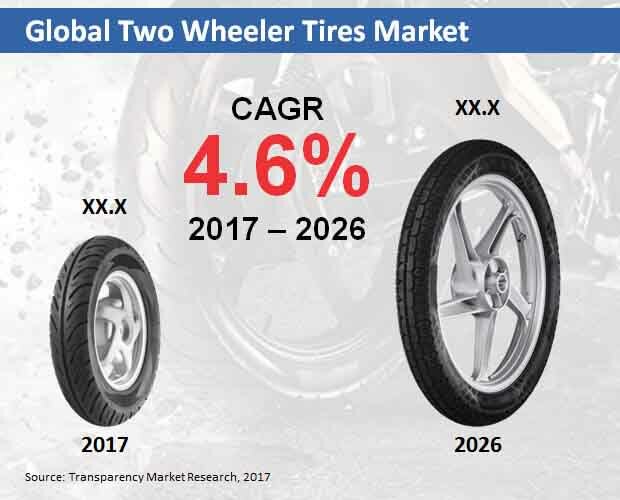 According to the report, the global two wheeler tires market is expected to rise at stable CAGR over the course of the forecast period and is likely to touch a valuation of US$16,940 Mn by the end of 2026. Based on region, the global two wheeler tires market has been segmented into North America, Europe, the Middle East and Africa, Asia Pacific excluding Japan, Latin America, and Japan. Amongst these, Asia Pacific excluding Japan is likely to emerge as the principal region for the growth of the market owing to countries such China and India where the demand for two wheelers is comparatively high. Moreover, as the road infrastructure of India is relatively poor, the aftermarket for two wheeler tires is also high in this country as people go for replacements. The two wheeler tires market in Asia Pacific excluding Japan is anticipated to reach a valuation of around US$6,084 Mn by the end of 2026. The demand from European countries is also expected to be high owing to government subsidies being provided for tires manufacturers in the U.K. and Italy. Based on demand category, the global two wheeler tires market has been divided into OEM and replacement. Among these two, the replacement category is expected to lead the market in the long run as the demand for replacement is higher in most of the developing countries. The replacement market is high owing to the wear and tear of tiress and the need for maintenance. The cost of replacement is also low as compared to OEM. The prevalence of leading companies is expected to trigger intense competition in the market making this market an oligopolistic one. On the other hand, small-scale players are witnessing increasing challenges in gaining hold on the market. The leading companies operating in the market are Bridgestone Corporation, CEAT Limited, Apollo Tyres Ltd., JK Tyre & Industries, Deestone Company Limited, and MRF Limited, among many others. A new market research report has been published in the repository of Transparency Market Research on two wheeler tires. The report provides incisive insights on the chronological growth trajectory of the market along with the present and future growth prospects present in the market. The report offers an exclusive analysis of the global market along with regional and segment based insights. The report offers an entires summation of the market including an official abstract that draws out the centre examples progressing in the market. It furthermore discusses on a couple of facets, for example, drivers, obstacles, and prospects that have been found in the global market. It also acquaints readers with figures related to volume, value, and development rate of the market from a growth point of view. With respect to market segmentation, each segment is analysed and presented in the report. It also gives an evaluation in light of the market circumstance, and moreover presents a value chain analysis of the products and applications in concern. A year to year progression of the market has likewise been offered in the report for the reader to be particularly aware of the changing scenario of the market. The report is the end result of the cautious research work of the market analysts employing reliable sources. The information introduced has been studied carefully by industry experts of TMR. The data that has been presented here has been assembled from various tried and tested sources. The figures have also been checked by the examiners and can be used to settle on key decisions and formulate strategies. The market study conveys an immense outlook on the engaged scene of the overall two wheeler tires market. It features the competition prevalent among the present vendors in the market and also puts weight on the future circumstance of the market. The profile of the players is based on a SWOT examination sought down by company angle, product portfolio, strategies, finance related information, and year-to-year projections. The organizations have been explored minutely covering their key developments, innovations as well as mergers and acquisitions and agreements with other prominent organizations.